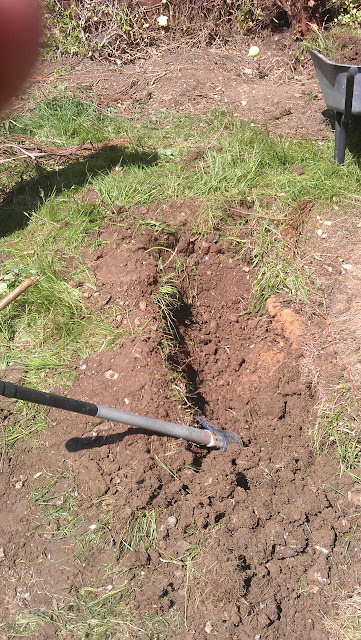 One of the only times I paid other people to do some work-laying the foundations. 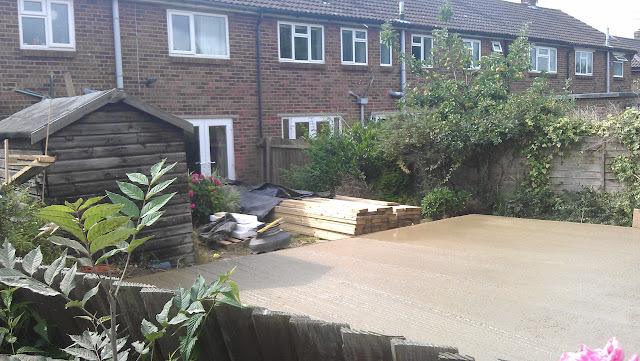 For this I paid for a cement truck and a pump in order to get the concrete down quickly. This was a really good service and extremely quick. They came at 09:00 in the morning, the concrete was down by 10:30 and you could walk on it by 12:30! 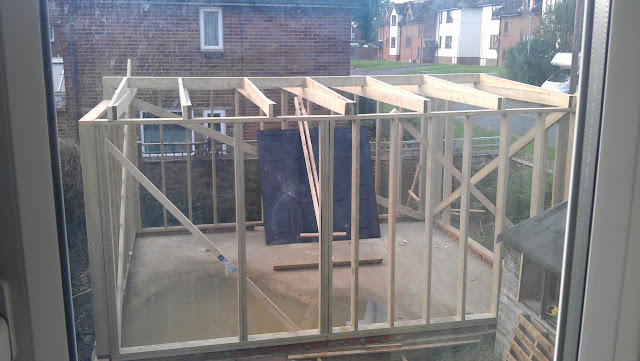 In the background you can see the wood for the frame! 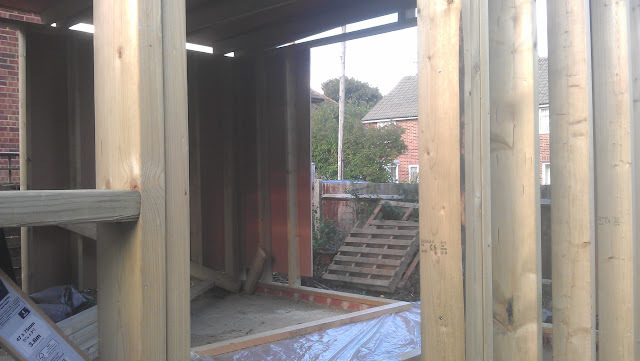 For speed of construction, I decided to use a wooden frame for this building, which would then be clad in ply. 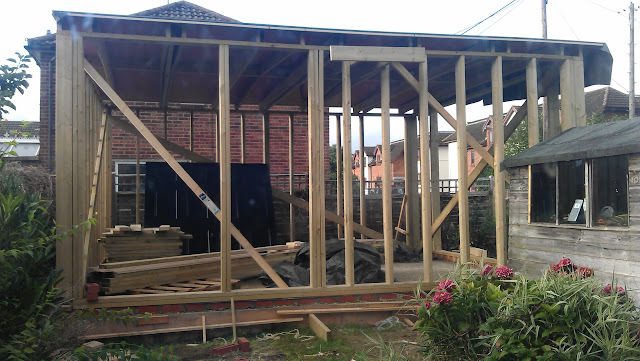 After taking a week off work, the entire frame was built and the outline of a roof in place! 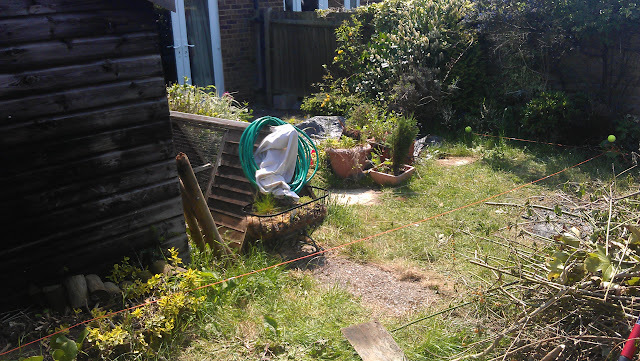 In the first picture, you can also see a basic home-made crane used to lift the wall sections into place. 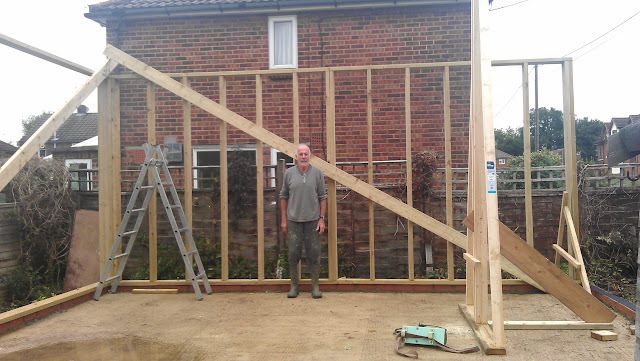 This made an enormous difference when working with something this size, with just me and Dad who had been pressganged into helping! After the frame was built, the whole thing was clad in exterior plywood, leaving gaps for the garage door, pedestrian door and a window. 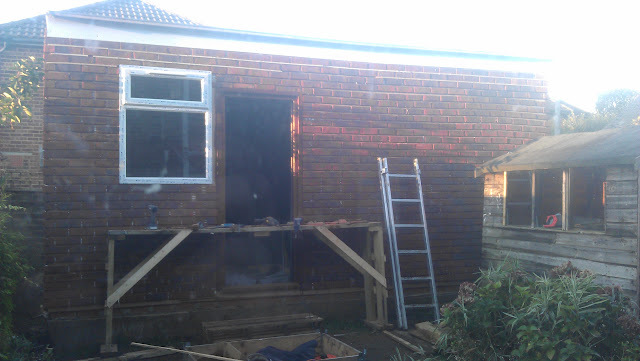 As part of getting planning permission, I had to agree to have a brick finish on the outside. This ensure it fits in with the other houses around me. I used slip bricks for this, which are bricks which are around 12mm (1/2″) thick and can be glued onto a substrate. They also come in corner varieties which can be used to make the corners look like real bricks have been used. 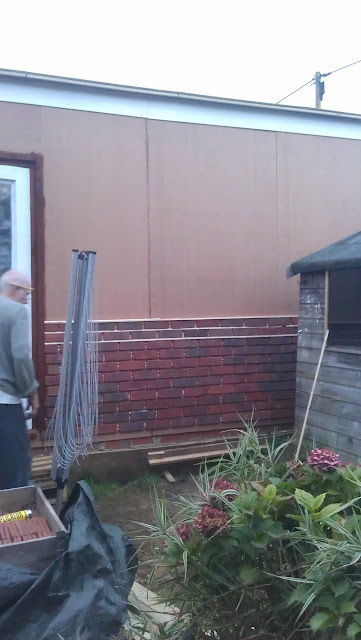 The next step was to add mortar into the gaps between the slip bricks. For this I used normal mortar but with lime added. The lime keeps the mortar flexible and means that if the plywood expands and contracts with temperature, moisture etc, then the mortar won’t crack. So, finally onto the inside! 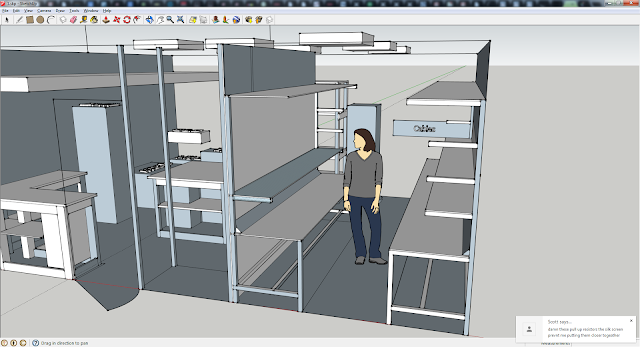 I used sketchup to plan the inside layout, basing it around a mechanical side and an electronic side. After the last workshop where I had continuous problems with dust on the electronic test equipment, I wanted a wall and a door separating the sides. On the mechanical side, I’ve got a right angle bench for the lathe and mill. There’s an island workbench in the middle for general assembly with storage underneath for tools and parts. In the back left corner there’s the “messy” area, with the table saw, MIG welder, grinders and bandsaw. 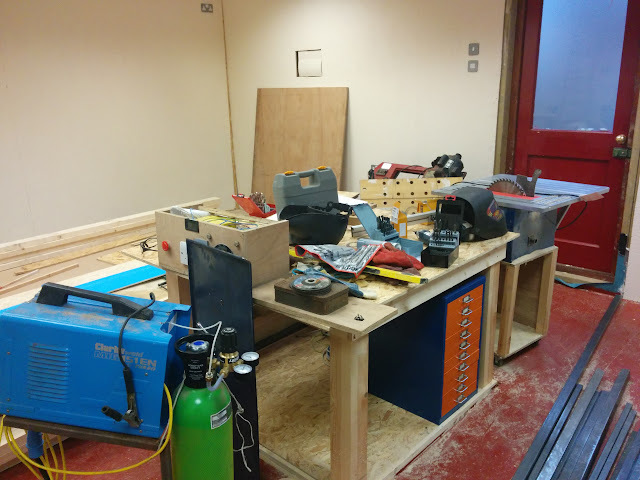 The bench at the back is the chemistry bench for general chemistry work and PCB etching. The electronics side consists of two long bench facing each other. They’ve got storage underneath, as well as lots of shelves for test equipment and general storage. The far end of the area will be used for assembly so I’m planning to keep all my wire on the wall and components in a rotating carousel. The plan then is that while building PCBs, getting a part will just involve spinning around on my chair! I added a storage level on one side of the workshop. 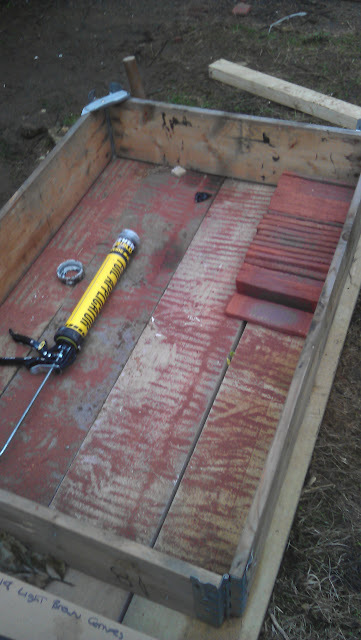 This should be particularly useful for keeping 8’x4′ wooden sheets out of the way as well as the longer lengths of bar. Main “island” workbench going in. So that it’s nice and rigid when you’re performing delicate kinetic adjustments (hammering), it’ll be built into the floor. A layer of damp proof membrane was then added over the floor and up the walls. 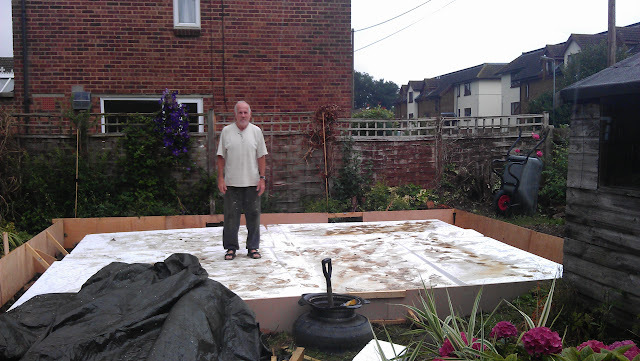 I then laid a base of 2″x2″ wooden beams with 18mm OSB on top. Then just on the electronics area, I laid laminate wooden flooring, second hand off eBay! 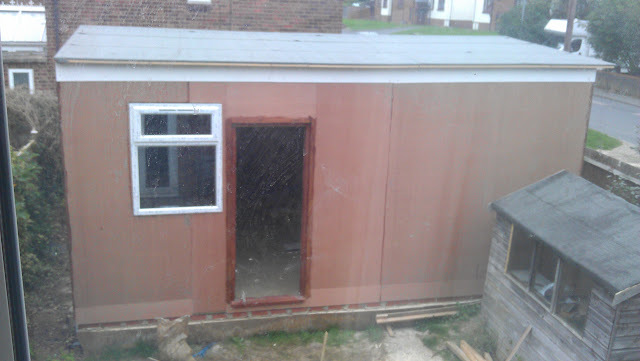 Next step, cladding the walls with OSB. Lathe and Milling machine bench gets built. This was made from 2×2 wood and clad with MDF. It’ll also be painted ready for the machines to be installed. 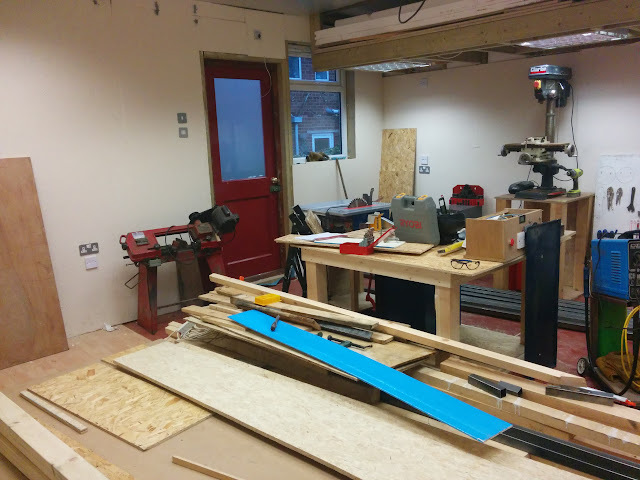 In the foreground you can see the main workbench coming together and a vice finally installed! 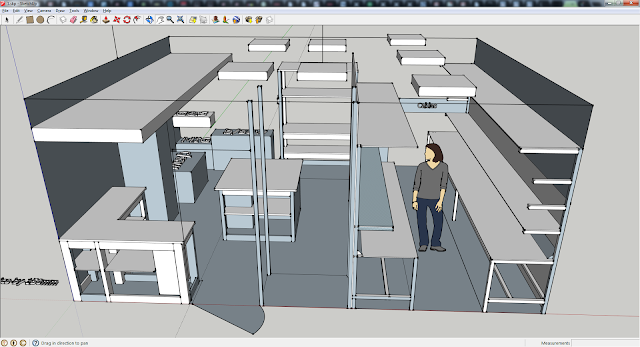 Next step is to start on the large electronics workbench. This is being built out of 40mm box section steel being welded together with a Mig welder; a very quick means of construction. I’ve set the worktop height at 800mm, a little on the low side compared to what I’ve read from other people, but I only work sitting down at my electronics bench and my mechanical work gets done at other benches. The twinslot sheling brackets have been added as well. Next step is to add some wood for the worktop and shelving, I’ve used 12mm plywood. Very quick to add, I’ve just cut it to size and rounded off the edge with a router. I’ll give it a few coats of varnish, but I’ve bought a 10m roll of ESD matting to add to the top to make the finished bench. So, this is progress so far. I’ll update this as the last few parts are finished!